West Africa had four British-governed territories until March 1957, when Gold Coast/Ghana become the first to obtain independence under Kwame Nkrumah. (Actually, there was also the ex-German Trust Territory of the British Cameroons, which was absorbed into Nigeria). The Gambia, Sierra Leone and Nigeria were the other three and we see below a smart sports saloon of the 1930/40s, from the Nigerian city of Onitsha in Anambra State. The port city lies on the banks of the Niger river and was an important trading settlement in palm oil. This expat. had been so successful there as to own and run what seems to be a very prestigious motor (Bentley? Jaguar? Alvis? ), and ship it home to England, where member Pemberton shot it in the late 1940s in London. 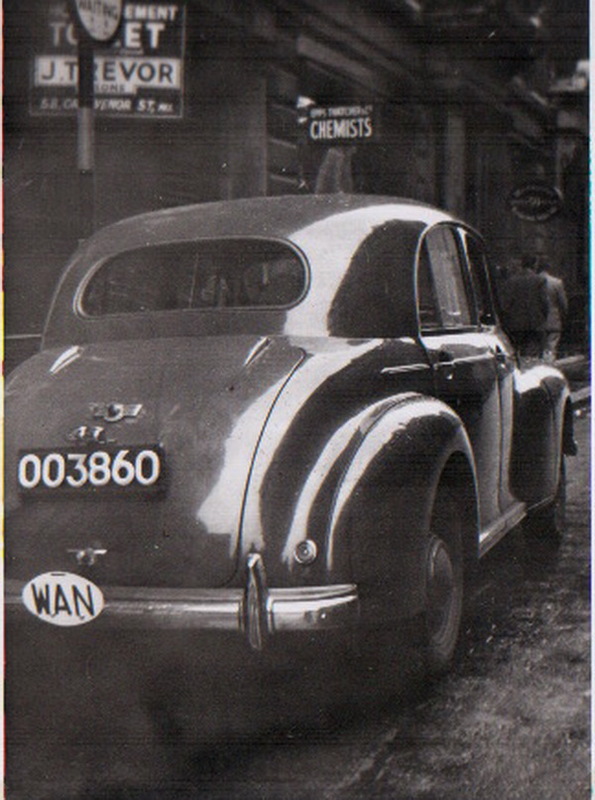 Below John P. also saw this 1948 Morris Oxford OM type, with the unusual OO code, probably signifying Abuja, now the administrative capital. Fortunately for us, he was carrying his camera on this wintry day in London. OO 3860 — Most interesting data concerning the Morris Oxford above may be read below, from Morris specialist SMODRIVER – see his 17/2/2013 notes in the Comments section. 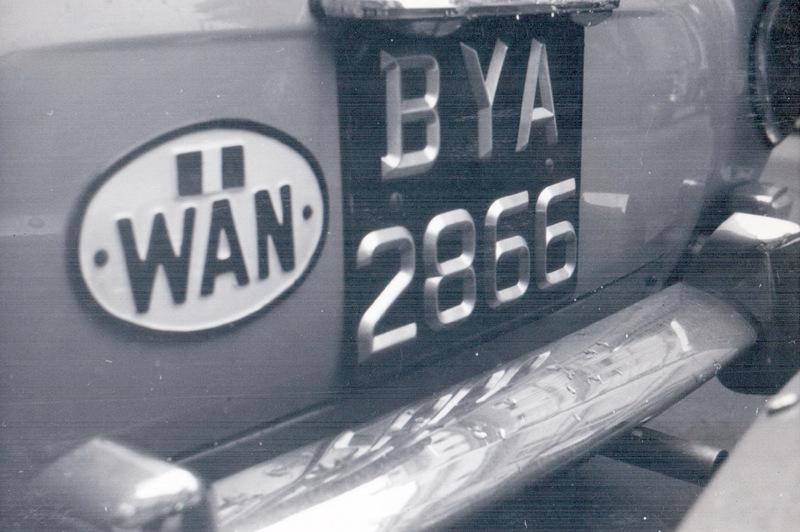 BYA 2866 was caught stationary in traffic during the early 1960s, and had the oval WAN not have been mounted, we would have been baffled by the non-African look of the plates. BYA = Jos city, a prosperous tin-mining area . 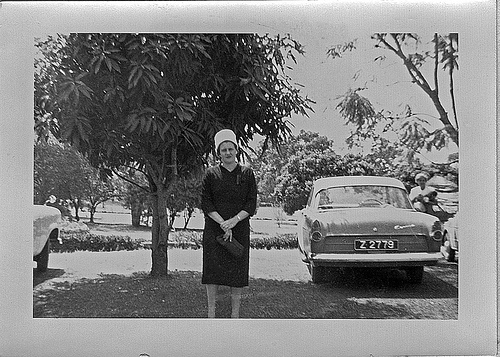 Z 2779 is a Flickr-sourced picture of a Ford Consul Mk2 in Zaria, Kaduna state. Must be about 1958. Below: CMD = Chef du Mission Diplomatique – Chief of Diplomatic Mission – Ambassador. 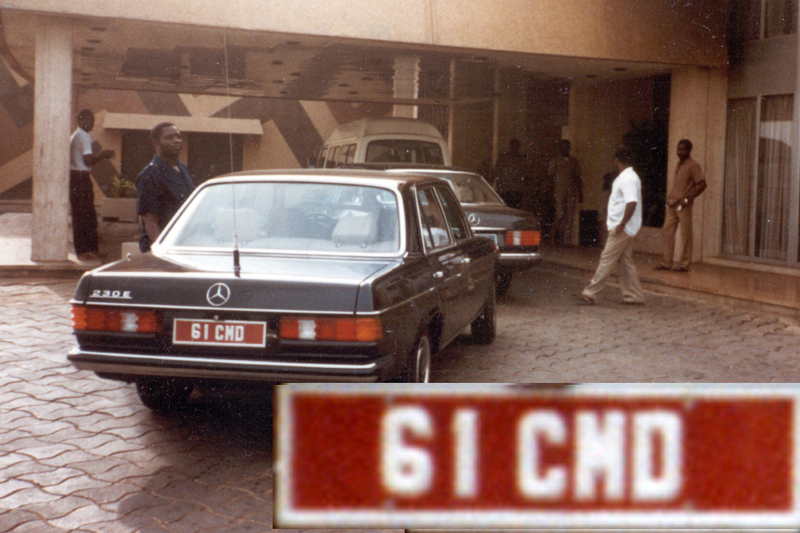 61 CMD was an ambassador’s plate, possibly for Hungary, and taken during the 1970s in Abuja by Murray Bailey 1970s. 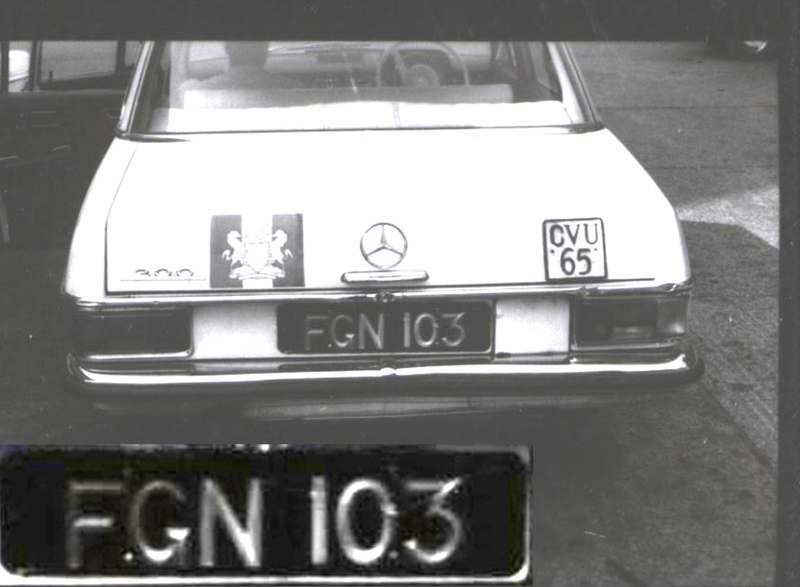 Below: 17 may be coded for the National Planning Commission, seen on this later-series1970s Nigeria Federal Government plate. 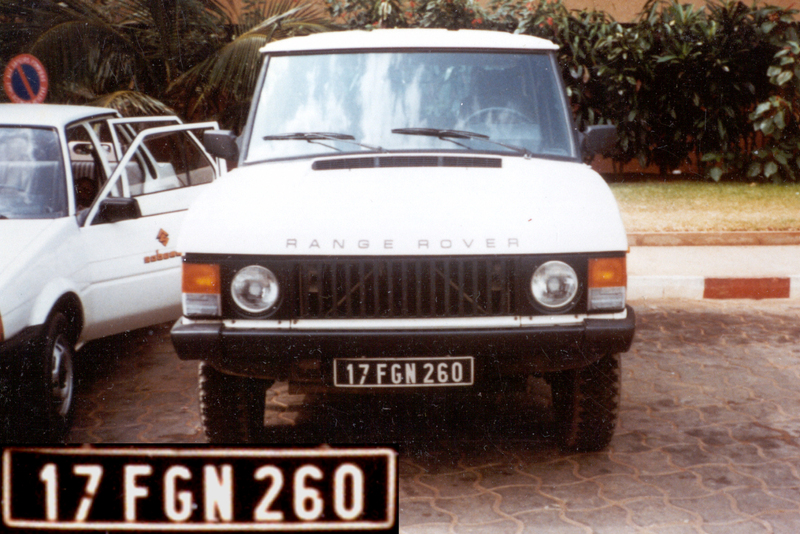 17 FGN 260 – a Federal Government plate of the 1970s on a Range Rover, in Lagos. Nigerian Air Force motorbike (leading zero) and Navy Land Rover. Brumby archive,1970s. Below: Another civilian series commenced in the early 1970s, using a regional code, with a serial number followed by a town code. Varying colours used for differing vehicle types. 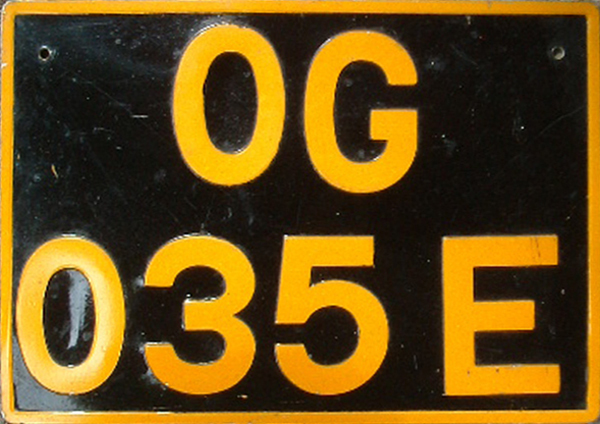 A radical change in Nigerian plate styles occurred in 1992 when the US style and dimensions of pressed plates appeared, continuing in use today. 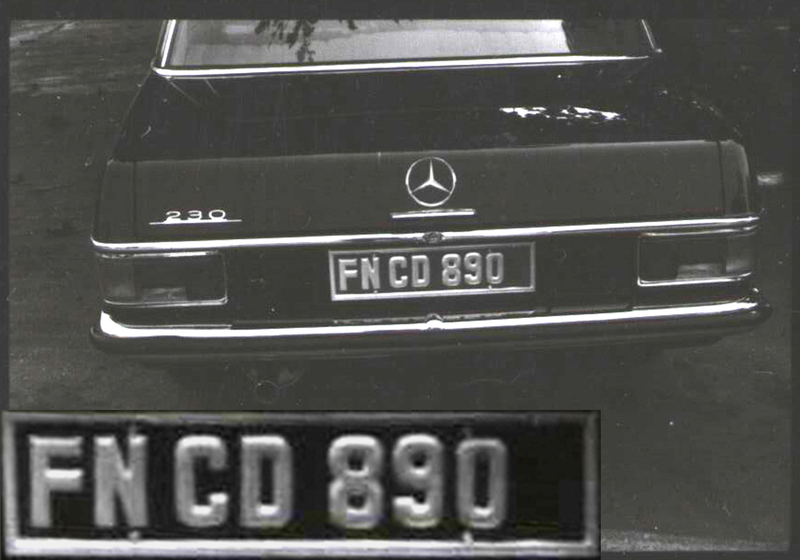 In earlier years, it was not uncommon to see Nigerian plates in UK, but for the last 30 years, it is possible that only one or two have been seen in all of Europe. UNLESS YOU KNOW BETTER!! Share it with us, please…. This entry was posted on Sunday, February 17th, 2013 at 3:10 am and is filed under Africa, Diplomatic, Government, Historic, Nigeria. You can follow any responses to this entry through the RSS 2.0 feed. You can leave a response, or trackback from your own site. 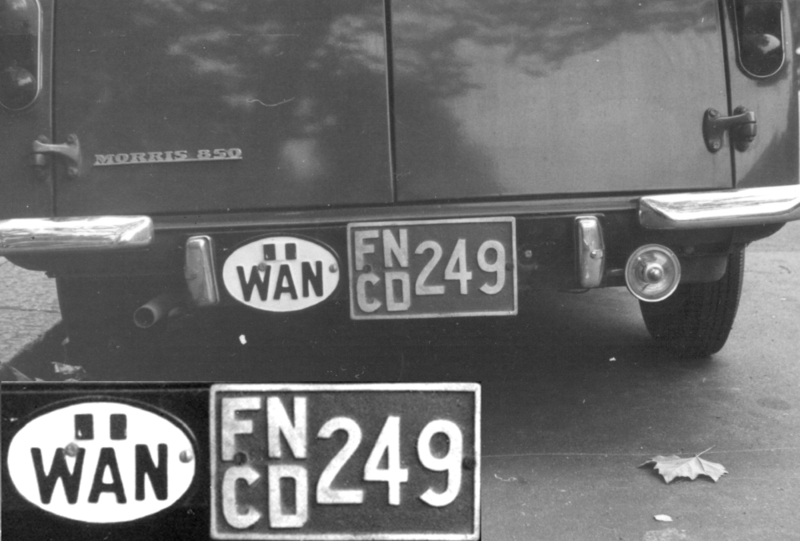 Your first car seems to be a Citroën Traction Avant. I thought so too at first, but thinking “British” it looks something like a Riley… I remember my Dinky Toys! 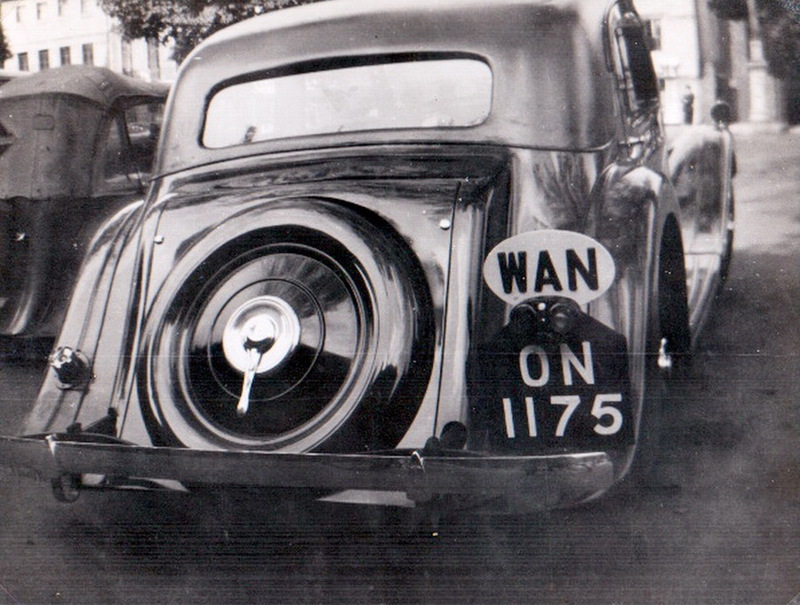 Bart – Citroen never fitted wire wheels, using the chromium knock-off hubs which are showing on this car. And David, I don’t think Rileys did, either, except on early 1930s models such as the Lynx and Kestrel. Might this be an Alvis, a Jaguar or a small Bentley? 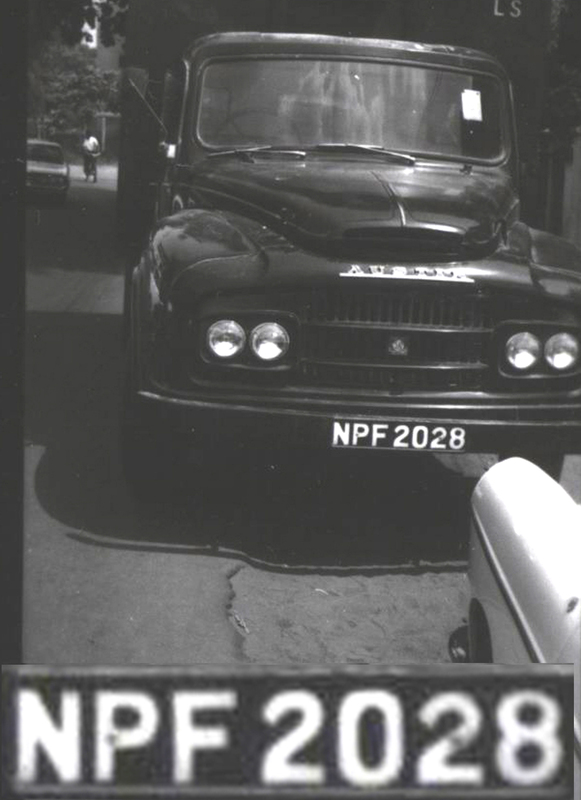 Hello – if Abuja, the Morris Oxford ‘MO’ 003860 above would have been delivered by Nuffield Exports to the Nigerian dealer: Compagnie Francaise de L’Afrique (CFAO)- from the very early type round lights, it would be a 1948 car and so is just one of 24 all LHD despatched. The number used was the first digit and not the last as one might have expected. Because of this everyone bought or borrowed even/odd numbered vehicles with the end result that the traffic congestion remained as before! 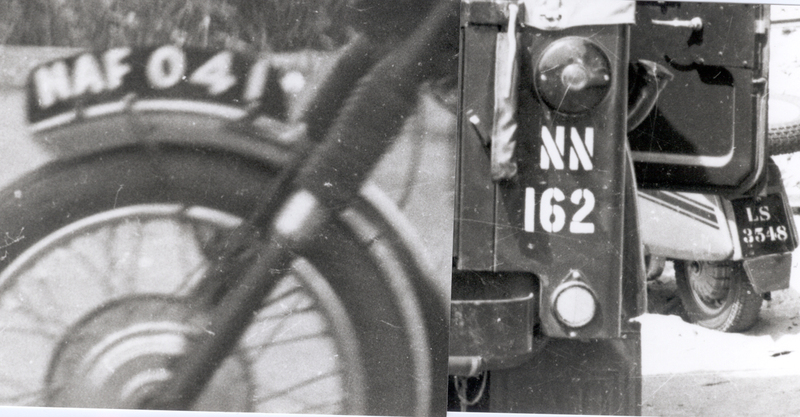 Those are remarkable details from ‘smodriver’ concerning the )) 3860 Morris Oxford! Clearly another hobbyist with an eye for very close detail! Thank you, ‘smodriver’ – and for your advice on the Somaliland estate car version of the same model on another Page. 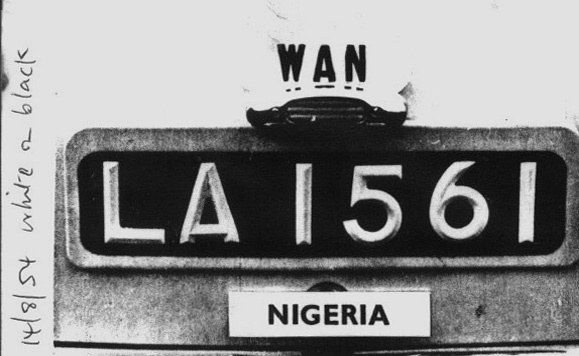 I didn’t think Nigeria switched sides of the roads until the 1970s, so OO 3860 might have been RHD, I can’t tell from the picture. Still it’s interesting that so few early ones were LHD, I guess even with “export or die” most were going to Commonwealth countries.